The two most common forms of algae that pond owners struggle to control are filamentous algae and planktonic algae. Filamentous algae (also called pond scum, pond moss, string algae, hair algae, frog spittle or water net) begins growing on the bottom of ponds on surfaces like rocks and logs and resembles green fur. As the clumps grow, they break loose from the bottom and float to the top, causing ugly green mats on a pond surface. 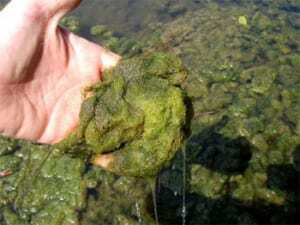 Filamentous algae begins growing in the early spring and is first noticed around the edges of a pond in shallow water. It has little redeemable value to a pond and can even ruin a recreation pond during the summer. BioWorld Algae Treatment is nearly 100% successful in eliminating filamentous algae and balancing a pond ecosystem. At the first signs of algae formation, we recommend starting weekly treatments. The goal is to get the algae under control in the first 6 weeks of treatments. 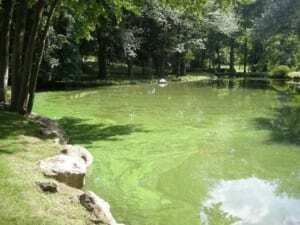 Planktonic algae (also called green water algae, blue green algae or pea soup algae) are extremely small microscopic organisms that give ponds a green color. A normal population of planktonic algae is mandatory for a healthy pond, as they are the base of the food chain, essential for the health of aquatic life and beneficial for a pond ecosystem. Planktonic or blue green algae are commonly found during the summer in ponds, lakes and water features. A combination of warm temperatures, sunlight and nutrient rich waters causes blue green algae to bloom. This can look like green paint floating on the water. Since blue green algae can produce toxins, it is dangerous for humans, animals or pets to drink the water or swim during a bloom. Signs of toxic algae may include dead fish or waterfowl, unexplained sickness or death of a pet, or skin rashes on humans. Even though blue green algae blooms are known to be very patchy in nature, avoid all contact with water when this kind of algae is present. If planktonic algae gain a foothold in a pond, getting rid of the algae can be very difficult. Typically an approved aquatic herbicide is needed to chemically treat the algae.